Every fish owner understands that caring for fish is as equally important as caring for other pets is. Provide them with a safe tank for them to call home, give them the best lighting conditions and proper bubbles to make them comfortable. Feeding fish with the best fish food is not just important in keeping them alive, but also in ensuring that they have optimum health. There are many brands of fish foods depending on the species and type of fish. Therefore, you ought to do your research and get the best quality for your specific pet before you buy and feed them on any product. Thankfully, there is a way of knowing whether or not you are giving your fish quality food, and that’s what this article is for. Here is a list of our top reviews for the feeds to give your marine, freshwater and tropical species. Read about the quality brands that are worth paying for. 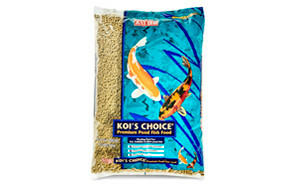 If you want the most exquisite food for your fish, look no further than the Kaytee Koi's Choice Premium Fish Food. Only a few brands in the market are as highly digestible as this is one. The feed is suitable for all seasons and for most fish types. It contains the required vegetable and animal proteins, as well as the essential nutrients necessary for perfect growth, health, longevity, and color. The feed’s manufacturer guarantees that there is 35% of protein, 5% of crude fat, 4% of crude fiber and 12% maximum moisture content. When feeding your fish, remember to follow the recommended guideline; in that, you only give them food that can be consumed in 5 to 10 minutes. If any food is left uneaten, make sure you remove it. 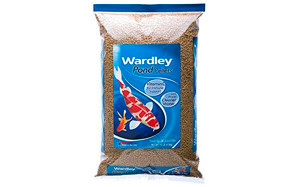 If you are looking for a fish food brand that does not contain artificial colors, helps to maintain clean water and is a great pond fish food, the Hartz Wardley Pond Floating Fish Food Pellets should be on your best fish food list. 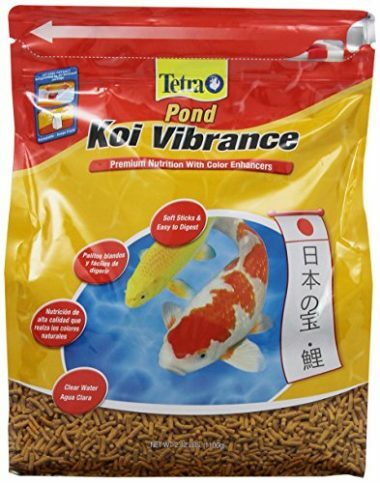 It is highly digestible and is best for goldfish and koi. The protein to fat ratio in this brand is at its optimum, so you are sure that the fish will grow well. The immune system of the fish will also benefit from the pellets because they contain vitamin C, which is a requirement for a healthy immune system. When feeding your fish, give them the quantity that they will eat in 5 minutes. Feed them between two and three times a day. This is a complete diet for your koi, which is enriched with color enhancers to keep them colorful, as it is intended in nature. The brand assures you of total digestibility and reduces water pollution as long as you feed the fish as directed. The pellets have a hollow center that allows for maximum metabolic efficiency and easy digestion. Considering that the feed is enriched with vitamins, you are assured that the immune system of the fish is well taken care of too. Use the food during spring, fall and summer when the temperatures are 50 degrees Fahrenheit and above. Feed your fish between two and three times a day, with food that the fish can consume within a few minutes. 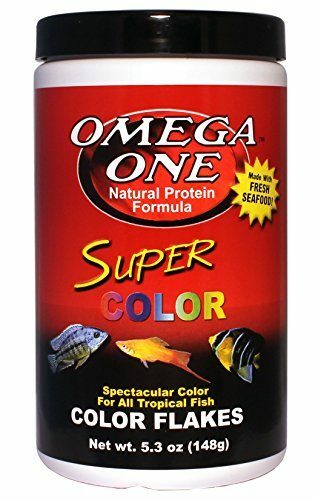 The Omega One Super Color Flakes is a great choice for fish owners who want to enhance the color of their fish. It is filled with natural color enhancers like salmon skins, which have color pigments known as beta-carotene. Once your fish consumes the feed, you can be assured of almost 100% transfer rate to the skin. 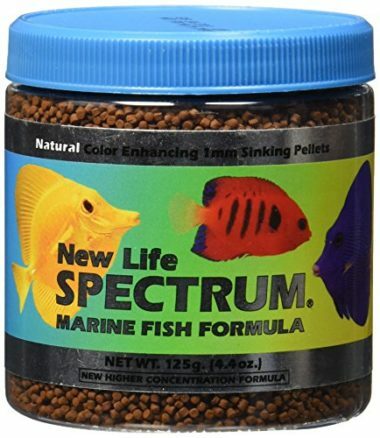 So, this is an excellent choice for ornamental fish. The feed also contains the recommended quality of seafood protein and fresh, natural fats. It has low ash content and has fish kelp. Another good thing about this brand is that it does not cloud the water. Feeding should be done three times a day, using only the content that fish can consume within a minute. The HARTZ Wardley Shrimp Pellets is made using a host of nutritious ingredients such as ground wheat, animal fat, fish meal and shrimp. 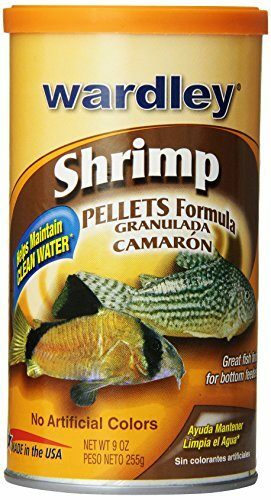 This is an excellent tropical fish food choice, particularly bottom feeders like loaches, plecostomus, and catfish. If yours is a large fish, these fish pellets are ideal because the sizes are suitable. It also maintains clear water and does not contain artificial colors. The product is one of the leading fish feed suitable for goldfish. The flakes strengthen the resistance to diseases and stress of your fish. It is nutritionally balanced that is easy for your fish to digest. Some of its constituents include dried yeast, wheat gluten, brown rice, oatmeal, and fish meal, among other healthy ingredients. You will be glad to know that it doesn’t cloud the water and it is easily digested. 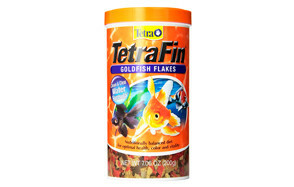 Most of the goldfish owners who have tried using this product say their goldfish rush to eat the flakes, regardless of their size. So, it is an ideal goldfish food. The feed is suitable for everyday feeding. Its main constituent is raw protein from spirulina. It is ideal for both salty water and fresh water fish that require lots of protein. 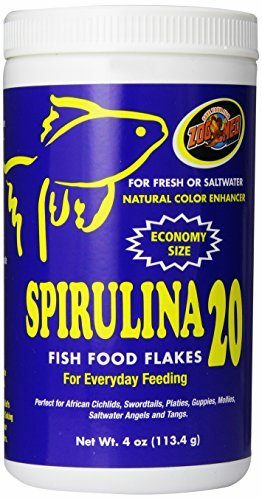 The fish that will love the Zoo Med Spirulina 20 Flake Fish Food the most include Platies, Mollies, Tangs, Swordtails, Cichlids, Guppies, goldfish, and saltwater angels. Most fish owners who have tried the product claimed to have loved it and would want to use it again. When feeding this food to your small fish, make sure you break the large pieces, as they might be unsafe for your fish. When buying the product, you may consider picking the 4-ounce container, since it costs almost the same as the 2-ounce container. 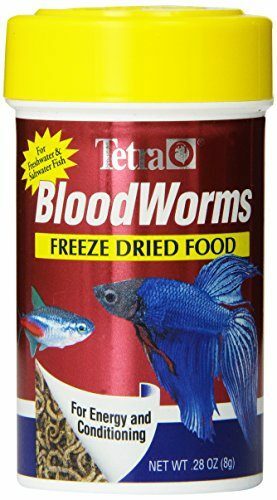 The Tetra Blood Worms will make your fish want to jump out of the water with glee. They are filled with the nutrients your fish require, ranging from good healthy fats, phosphorus, fiber and high protein levels. When your fish eats this product, it will receive an energy boost as well as conditioning. The feed is suitable for small to medium fish. Considering that the company has been operating since 1951, you are assured of top-notch quality from the feed brands they produce. With the strict processing procedures that the firm employs, one is sure that there aren’t any undesirable organisms. However, one should be cautious when using it. This is because it contains insect larvae, which might trigger an allergic reaction such are irritation of the eyes, running nose and wheezing. That is why asthmatic people are requested not to touch it. All the same, it is safe for the fish. This is one of the highest-rated brands in the market. It is best for salty water and freshwater fish. It is dynamic, in that it can be used by all marine species; including omnivore, carnivore, and herbivore. Considering that the fish pellets are derived from whole herring and krill, they are easily digestible by fish and help in enhancing their immune system. Some of the fish that will enjoy this delicacy include bala sharks, African cichlids, panda coris, catfish, fancy guppies, crown loaches, and emerald. One of the features that make this brand outstanding is the inclusion of garlic, which is good for fish. When purchasing this feed, consider buying the 500-gram container because it is a bargain, unlike the 250-gram container. It comes with a 2-year expiry date, so you are assured of longevity. How can you ensure that the food you give your fish is the best? Fish are just like humans, in that they do best when they consume a well-balanced diet. Although this will depend on the kind of fish you have, natural foods are the best for your fish. Fish require a variety of foods to provide them with the nutrients necessary for their growth. Here are the things to consider when choosing good fish food. Does it have the nutrients that the type of fish you keep requires? When choosing fish food, you should only go for the variety that is required by the kind of fish you are keeping in your fish tank. As the name suggests, this is the type that feeds on meat. They are predatory or scavenging fish. They thrive on live food such as worms, shrimp, insects and small fishes. Some examples of carnivorous fish include pike, perch, salmon, and walleye. This type feeds on vegetables and plants only. They are vegetarians; feeding on plant-based foods like fruits, algae, and vegetation. Examples of herbivorous fish include goldfish, mollies, tilapia, and shellfish. If your fish is herbivorous, you should feed them often because they have small stomachs. These can be likened to human beings because they eat both vegetation and meat. Their diet is flexible. Examples include catfish, Koi, and Shiners. Will it be suitable to where my fish lives? The choice of the type of food to buy should also be based on where the fish lives. The part of the pond or tank where the fish lives is an essential dietary consideration. Such fish live close to the surface of the fish pond or tank. Top feeders tend to make the topmost part of the tank colorful. The fish has to go to the upper part for oxygen, sunlight, and food. Top feeders are often good jumpers so that they can hunt and catch passing insects. Some of the common top dwellers include glass catfish, silver hatchet, and butterfly fish. As such, you can feed them on any floating fish feed. Middle feeders stay in the middle part of the aquarium, tank or pond. You need to be cautious when feeding this type of fish. This is because if you only buy feed that either floats or sinks, your fish will not have anything to feed on. Therefore, consider buying food that does not sink fast because it will allow your fish adequate time to feed. Common mid level feeders include tiger barb, pearl gourami, angelfish, and guppy. Just as the term suggests, this type of fish stays at the lowest part of the pond or tank. They act as the cleaning team of your fish tank or fish pond. If you have low feeders in the tank, you will notice that they will sink to the lowest part of the tank. This type of fish prefers to eat algae. Some of the well-known bottom feeders include tilapia, catfish, snails, carps, and shrimp. You may use tablet pellets or commercial pellets to feed the fish. This is because they will sink inside the pond, making food available for the bottom feeders. We all know that keeping pets is an investment, but how much should you spend on keeping them? The cost of fish food varies widely, depending on the type and the quantity of the fish feed. Some kinds of fish should frequently be fed, while other kinds require more food than others. Other types can survive solely on natural food. If you want to cut down the cost of fish food, try feeding them on naturally occurring feeds such as the waste that comes from your agricultural system. For instance, you can give your fish insects, worms, and scraps from the poultry farm. Such sources are not just readily available and healthy for fish, but they are also inexpensive. Remember that keeping various kinds of algae in the pond helps in making the environment inside the pond or tank conducive for the fish to stay. They also eliminate the need for buying commercial feeds. Before going to the store to buy food for your fish pets, you should first understand the various available types. They are an ideal form of aquarium fish food. Also, it is one of the most popular choices among fish owners. If you plan on buying a catfish, this food is ideal because it sinks to the bottom. That way, the fish that is at the bottom of the pond or aquarium can access the food. They come in different sizes. Therefore, one can choose depending on the size of the fish. 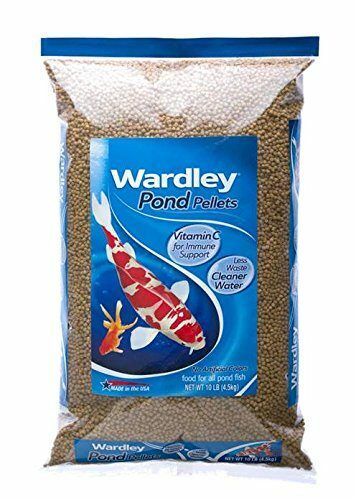 If yours is a large fish, you will need large pellets. If it is a small one, you will require small sized pellets. This is the excellent form to pick for betta fish food. Small and medium-sized fish will love this food a lot. This is because the food floats on the water when they are put first, and then they sink once they stay in the water for a while. This kind of food is eco-friendly. However, you should feed the fish with the crisps that they can consume at once because they leave a residue that can make the water inside the tank dirty. This type of fish food does not sink quickly. Therefore, it is ideal for top feeders because they get to feed on it before it descends into the depths of the aquarium or pond. They are usually safe for the big species. They also sink to the bottom. In a bid to preserve the protein in the food, the owner should dry and freeze the fish food before feeding it to the pets. You may also find medicated foods that can be stored and handled differently before giving them to your pet. This is perfect for the traveling pet owner. The blocks are made in a way that they can settle in the tank for several days; thus they release enough food every day. Do Fish Have Taste Buds? Yes. Just like humans, fish too can feel the difference between salty, sweet, bitter and sour. The taste buds can be found on the tongue, in the mouth or on the outer parts of the fish’s body, such as the fins. Fish that live at the bottom of the water like catfish taste through the tentacles, which are located on the head. Q: How much food do I need to give my fish? In nature, fish do not have to eat breakfast, lunch or dinner; they eat whenever they are hungry, and the food is available. In case the food sources are plateful, the fish will eat countless times in a day. On the other hand, when the meals are scarce, they might fail to eat for several days. That is why fish are opportunistic when it comes to food. This means that whenever you offer them food, they will gobble it up, even if they are not hungry. Remember this next time your fish begs you for food. Fish will note the person who brings them food and will start jumping when they see the person, even when they are not starving. The rule here is to never give your fish more than they can eat in five minutes. When you doubt how much they can finish, you had better underfeed them by starting with a small amount. Also, remember that the amount of feed depends on the type of fish. Make sure that your fish is receiving the right proportion of food that they need to stay healthy. Also, if you are rearing a community of fish, make sure you consider the dietary needs of every species and find a way of balancing. A common myth is that fish explode when they overfeed. Well, one does not have to worry about that because it is not true. However, there are consequences associated with overeating in fish. When it happens, you will not notice the effects immediately. Overfeeding makes the fish to be stressed and it might lead them to suffer from fin rot. Some species develop a fatty liver condition that is known as hepatic lipidosis. In most instances, the detrimental effects on the aquatic environment will affect the fish’s health. Uneaten food will produce harmful byproducts. If you notice that you have overfed the fish, remove the excess food immediately using a net or a siphon. If you fail to remove the food, you risk interfering with the chemistry of the water in the fish tank. Ammonia and nitrate levels might rise, and the pH and oxygen levels drop, making the water unsuitable for your fish. The by-products might also encourage mold growth, promote algae bloom and cloud the water. Q: Do I need to vary my fish’s diet? A: Yes. No single food can provide the nutrients required by fish. For your fish to live healthily, it requires protein, carbohydrates, minerals, lipids, and vitamins. Therefore, you should feed them with a variety of foods. Use a supplemental diet and a staple diet. Also, fish have taste buds, so they enjoy a variety of textures and taste. Variety will enhance the quality of your fish’s life. Besides the usual flakes you buy from the pet store, here are some of the foods you should include in the supplemental diet, depending on the type of fish. Invertebrate foods are an ideal supplement for tropical fish, and they are available widely in frozen packs. However, feed a small amount of these foods to goldfish because of the extensive protein content. Q: Do fish need to be fed on a daily basis? A: Yes. You should feed your fish at least once every day. The rate with which you feed your fish varies on the type of fish. 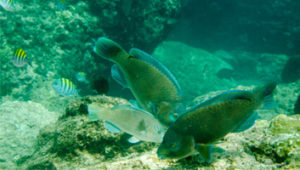 Usually, fish flourish when they feed once a day. However, it is recommended that you feed them twice every day. Regardless of whether you feed them once or twice a day, the main point is to make sure that you keep the feeding at a minimum. The time you feed them does not matter unless your fish is nocturnal, such as catfish. In such a case, make sure you feed them before going to sleep. However, there are some exceptions to once-per-day feeding rule. Herbivorous fish such as Farowellas, Mollies, and Silver Dollars should often eat because their stomachs are relatively smaller. In nature, such fish graze on plants all day long. You can give them some pellets and then supplement with live plants for them to nibble. Q: Is it true that some cichlids should not be fed “bloodworm”? A: Yes, the African cichlids should not be feed on animal products such as bloodworm. The reason why you should limit the bloodworm and other animal products that you give to cichlids is this: because African cichlids have been feeding mainly on seafood and algae over millions of years, they have undergone evolution by developing a longer intestine than usual. Therefore, the gut is unable to digest some terrestrial animal fats. This leads to blockage. Eventually the fish is unable to excrete waste, and finally, it dies. That is why animal products should not be part of the African cichlid food. 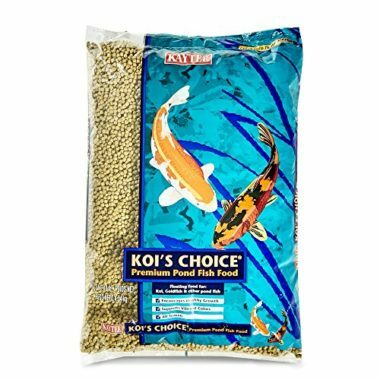 If you are looking to give your fish the best quality in the market, you should consider Kaytee Koi’s Choice Premium Fish Food. The food is easily digestible, and it does not cloud the water. Fish owners who have been using this brand noticed that their fish grew quickly. The feed will float at the top so your fish will love it. Considering that it contains both animal and plant protein, you can be sure that your fish is getting the variety it requires.